Learn about all of the ways this year’s food, events and weddings will make a statement. When it comes to hosting an event or wedding, incorporating a new trend is always a must to impress guests. 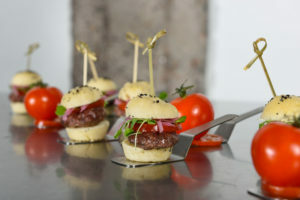 Food trends are always the best way to integrate a fun twist to an event or wedding. 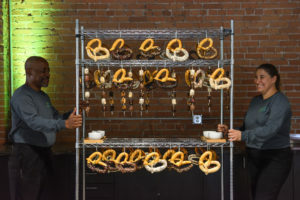 Having the expertise from a catering company, such as Artisan by Santa Barbara Catering, is the perfect way to treat your guests to restaurant quality food trends. When it came to 2016 food trends, flashy and colorful were the must-haves at any event. Family style, comfort dishes with community tables were a new way of dining at events. 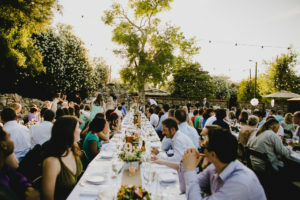 After dining together, late-night snacks were a Phoenix wedding favorite for Artisan by Santa Barbara Catering brides. While Kale salads and sweet potato everything were food trends for 2016, vegetables as a focus on menus will not be going away any time soon. People are craving unique ways to eat healthy, and with dietary allergies and restrictions increasingly becoming a normal focus for menus, an emphasis on vegetables is a winning solution. It’s now hip to order a vegetable focused entrée, with meat (if any) playing a small role in your meal. At Artisan by Santa Barbara Catering, our focus is always seasonal and local whenever possible when it comes to vegetables. This new trend is the perfect fit for any catering job with Artisan by Santa Barbara Catering, as simple produce turned into delicious dishes is our specialty. Keeping vegetables in their true form are the new way to present and eat at events. Keeping the natural flavors of a vegetable remind people the delicious flavor that can come with eating healthy. 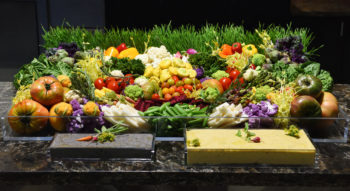 Artisan by Santa Barbara Catering has created a crudité vegetable garden that showcases local and seasonal vegetables in raw form. Depending on the menu or event theme, an organic dip can also be created to accompany. A few favorites at Artisan by Santa Barbara Catering in Phoenix to accompany are Black Bean and Cilantro Hummus or a Roasted Chipotle and Yellow Beet dip. Vegetables are now being considered a comfort food, a different take on traditional comfort food dishes. Instead of traditional rice, roasted and riced cauliflower is a comfort dish. According to Pinterest, there is a 336% increase in the word veggies being used in comfort food searches. Artisan by Santa Barbara Catering has several dishes that accommodate gluten free and vegetarian guests. Sweet potato planks are savory replacement for a bruschetta appetizer. 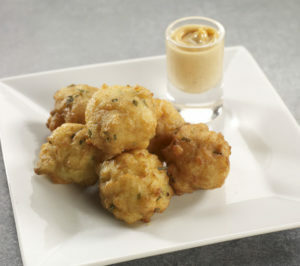 A single serving of vegetables such as zucchini or cauliflower, are added to fritters with an accompanying dipping sauce. A menu favorite is Nopales Cactus Fritters with Tomatillo Crema Dip. Sauces are not a new addition to a meal, but upgraded versions of traditional condiments are the new way to spice up your event. Traditional sliders will now be topped with Spanish Chorizo Aioli. Tacos are topped with Mango and Red Pepper relish. Salmon is glazed with Habanero Pepper Jelly. Sushi has always been a popular appetizer for events, but now Japanese condiments are leading the way. Items made with sesame oil and miso is the new trendy way to add an international flair to your local event. Grains are still a popular menu item, and in 2017 be on the lookout for more ancient grain names adorning salads and side dishes. Teff, Sorghum and Wheat Berry will be high protein items for menus. 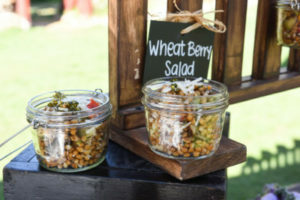 Artisan by Santa Barbara Catering in Tempe has created a Wheat Berry Salad, which is the perfect side dish during a lunch event. Wheat berries contain lots of fiber and protein along with Vitamin B. This ancient grain side salad contains Wheat Berries, Seasonal Veggies, Feta, Chopped Basil and Chives, and a White Balsamic Dressing. 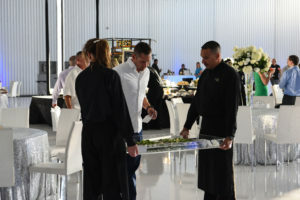 Rolling entree cart at catering eventWe are in a world of motion, so much so that food stations are a thing of the past unless they are moving. Food being brought directly to event attendees is now the way of events, to engage and create an activity at an otherwise uneventful evening. 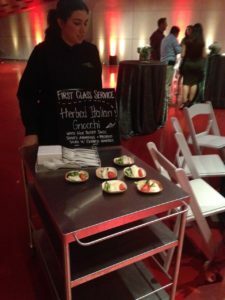 Artisan by Santa Barbara Catering in Phoenix not only wheels dessert and coffee, but full entrée stations around events. This is also an opportunity for table side demonstrations at these “meals on wheels” stations. 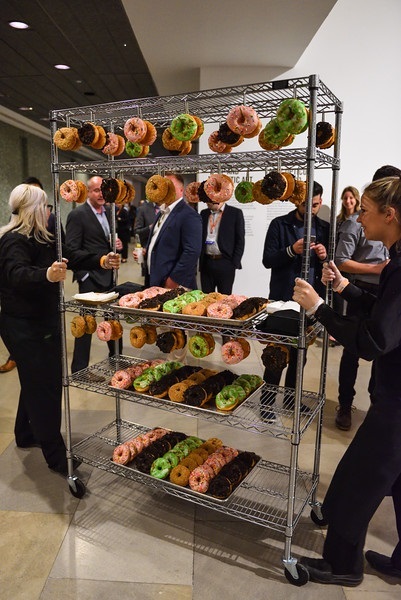 From rolling donut carts to family style meals, interactive dining was the way to add that special touch to your event. While all of these trends were for 2016, the added value of these food trends are now something that customers naturally want at their events. Along with food trends for 2017 events, catering clients are also looking for restaurant grade plates being presented when dining. This is not a trend for Artisan by Santa Barbara Catering as this is an every day mission for the Scottsdale catering company. These higher expectations and standards of service create award winning experiences for Artisan by Santa Barbara Catering clients. Overall, customers are looking for healthy ways to create their menus with vegetable alternatives being a focus. These catering trends in 2017 are not difficult or expensive ways to upgrade your menu, which is a win for clients with Artisan by Santa Barbara Catering. When it comes to catering in Phoenix, national trends are started in the city, so be on the look out for 2017 events making a statement!